Glancing at the rewards for 65 Overall, there are a couple that I believe should be unlocked by default. Yes, getting from 60 to 65 isn’t a particularly long journey, but having to level up to dye your hair, unlock pro level animations and flashy passes, equip pre-game rituals, and select the ball on your MyCOURT, doesn’t feel right to me. Even as low level rewards, they’re not particularly exciting, and I’d suggest that pro level animations should be available from the moment you make it to the NBA (i.e. you become a pro). I also don’t like the idea of spreading out all the MyCOURT customisation over multiple levels, as was the case in NBA 2K19. Here’s what I’d suggest instead. Make the pro level animations available by default. 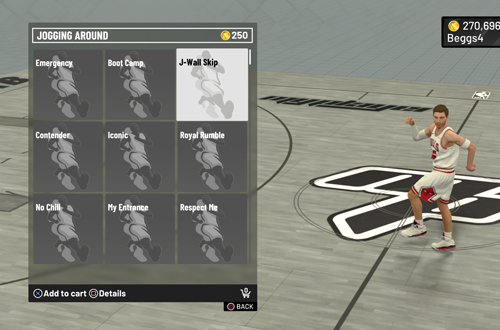 Unlock all MyCOURT customisation options at 65; there can be different MyCOURT rewards for higher tiers, which I’ll get to a little later on. Keep the MyTEAM reward, as it is good crossover content between the modes. Pre-game rituals could probably still be unlocked at this level, as barring any boosts from pre-order or purchased VC, you’re most likely going to be around 65 Overall once you make the starting lineup. I’d also gift the player some cheap shoes or clothing items, so that they can look less generic in The Neighborhood. Save the exciting rewards for higher levels. I’d keep the elite dribbling moves and flashy passes here, as it’s already generous that they’re available for a 70 Overall player. As I previously mentioned, the hoop options for MyCOURT would be unlocked at 65 Overall along with everything else, though they could also feasibly be available at this level instead. Celebrations are unlocked at this point on the Road to 99 in NBA 2K19, but they’re something I believe should be available at the beginning. As a compromise, my suggestion would be to make some of the celebrations available straight away, and unlock the more unique ones (say, the signature celebrations of superstar players) at 70 Overall or higher instead. It’s at this level that we unlock our first Personality Badge on the Road to 99, namely the Expressive Badge. Personally, I believe the Personality Badges should be earned through gameplay actions rather than automatically at a specific level. If you don’t celebrate frequently, then you definitely shouldn’t get an Expressive Badge. 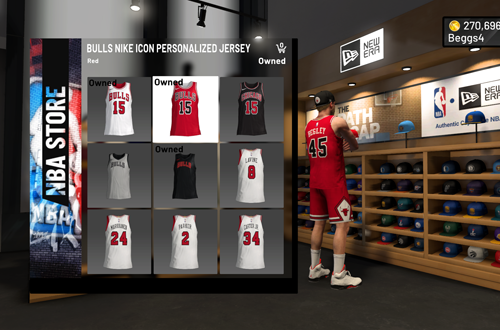 I do like the idea of your own jersey being available in the NBA Store at this point, as hitting 70 Overall represents reaching a point where your jersey is more likely to be sold. It’s a little silly that you have to buy your own jersey, but at this point on the Road to 99, there are still plenty of perks left to earn. I’d also throw in another MyTEAM bonus. 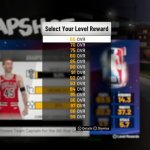 I thought about suggesting that the jumpshot creator should be unlocked earlier, and I don’t think that would be inappropriate, but I’ll leave that as a bonus for reaching 75 Overall. On one hand, I feel that the Mitchell & Ness gear should be available from the beginning – if you want to spend VC on clothes rather than ratings upgrades, then that’s your prerogative – but on the other hand, there’s room for cosmetic incentives on the Road to 99. I don’t find much appeal in the movement and emote animations, and consider them something else that should be immediately available, but they might as well be unlocked at 75. I’d suggest unlocking all tiers instead of just Tier 1, though. Speaking of cosmetic unlockables, something that I would suggest for 75 Overall is free accessories for all NBA games. At 75 Overall, you’re well-established as a player with a place in the NBA, so it only makes sense that your team will provide for you. I mean, even the lowest rated benchwarmer would get free gear from the team in real life, but at 75 Overall, you’ve invested enough VC for your team(s) to comp you gear for the rest of your career. Once again, keep the current MyTEAM reward, and move the MyCOURT scoreboard customisation to 65 Overall with the rest of the options. I think unlocking unlimited gear is a better reward this far along on the Road to 99. At this point, you’re knocking on the door of being an All-Star calibre player. Indeed, your play is probably already at that level. To that end, the rewards for reaching 80 Overall on the Road to 99 are a bit disappointing. The signature animations should unlock with the rest of them at an earlier level, and being granted the ability to spend a lot of VC on New Era gear and a football at Swag’s isn’t much of a reward. Instead, I’ll suggest that reaching 80 Overall should result in a slight discount at all stores in The Neighborhood. Likewise, the personalised jersey that you unlocked at 75 should now be free. If you already bought it, you can get some VC back from “jersey sales”. While it would be nice if jersey selection was available at an earlier tier, I do think it’s an appropriate reward for reaching 80 Overall. Since we’ve moved the animation and MyCOURT unlocks forward, we need a few more incentives for this tier. We’ll begin with another MyTEAM reward, and also bring forward the arena sounds and intro music customisation option from 85 Overall. Jewellery, and any other clothing items that haven’t already been unlocked, would now also be available. Leave the remaining levels for more substantial rewards than opening up new ways to spend VC in the Neighborhood. In fact, a few more free clothing items and shoes would be apt here. Once you reach 85 Overall, you should have access to all vehicles. They should also be unlocked and in your inventory at this point, not available for ridiculous prices. I worked it out, and bicycles cost over $31 million in-universe, which is just absurd. If there absolutely has to be a VC gouge with Neighborhood vehicles, at least limit it to customisation. With that being said, and some of the rewards already being moved to earlier tiers, keep the MyTEAM reward and increase the aforementioned discounts at all stores. In addition to NBA accessories being completely free, reaching 85 should grant the same bonus for all 2K Pro-Am and Playground accessories as well. It’s around this time that the prizes on the Daily Spin’s wheel are starting to become useless. You don’t really need the Skill or Gatorade boosts, and the number of fans and MyPOINTS that you can earn doesn’t really make a dent in your grinding. As such, this is a perfect time to increase the rewards that are available on the wheel. That way, it’s still worth your while to spin it once per day (or twice, once you’ve unlocked that reward). This might be difficult to implement since everyone enters the same building and spins the same wheels, but those rewards really need to level with the player, even if they only scale up once. 85 Overall is a good time for it to happen. Reaching this milestone on the Road to 99 heralds your arrival as a franchise player in the NBA, and that status should bring the ability to influence the moves that your team makes. Therefore, I’d say that unlocking those options at this point is the perfect placement on the Road to 99. Throw in another MyTEAM reward, and you’ve already got a couple of good incentives to keep levelling up. Adding the mini-basketball hoop is also a fun reward, though I’d also add the Play Now and Blacktop machines from 91 Overall to this tier. Basically, all other unlockable MyCOURT mini-games and items should now be available. You’re a superstar; you can afford expensive toys! Another idea for MyCOURT rewards is a complete overhaul of your living space. 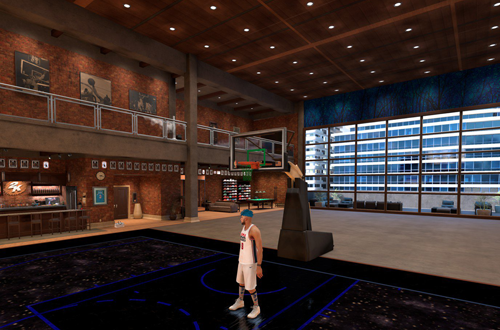 I really liked the idea of unlocking the lodge and penthouse MyCOURT in NBA 2K17, and it’s a shame we’ve been stuck with the same loft apartment MyCOURT for the past two games. As a superstar player, you can presumably afford even nicer digs, so it would be great to be able to unlock a couple of new MyCOURT housing designs in addition to the court customisation options. 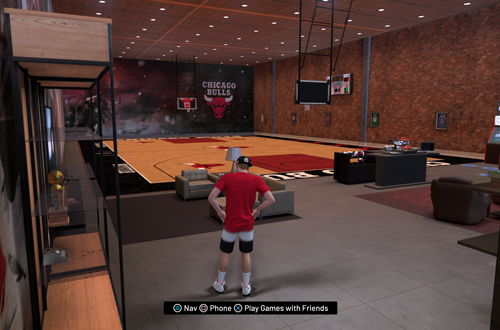 It was arguably more fun to unlock those different MyCOURT settings through making connections, but since that mechanic is no longer in MyCAREER, they can be a part of the Road to 99 instead. Arguably, it’s the rewards in these final milestones on the Road to 99 that need the most work. Honestly, a lot of them aren’t really worth the bother, and include options that should be available much earlier. Going shirtless in The Playground? That really shouldn’t be a reward, and if it is, it should be unlocked around 80 Overall. The same goes for the unlockable tattoo areas. I’ve already mentioned unlockable animations and the MyCOURT mini-games in earlier tiers, along with vehicles. The Gym Rat Badge, unlocked at 92 Overall, should be something that you earn by frequently working out in the gym. Better yet, remove that turbo boost mechanic altogether. So, what do I suggest? At 91 Overall, get invited to the VIP club, which increases both your MyPOINTS and VC earnings. 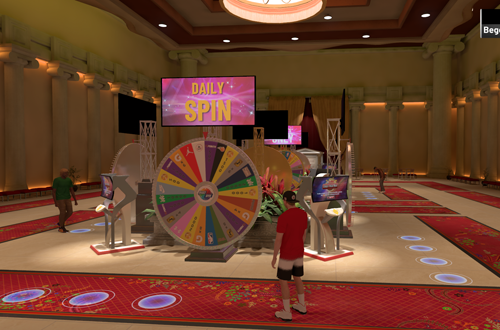 At 92 Overall, get a second spin of the Daily Prize Wheel. 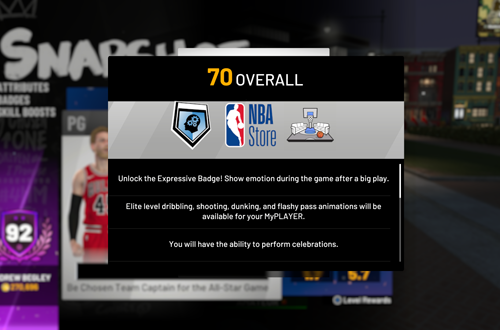 At 93 Overall, get a head start on a second MyPLAYER with maxed out Badges, and a higher starting rating than 60 Overall. At 94 Overall, unlock a jetpack or a hover board. At 95 Overall, earn the Legend Badge that boosts all of your other Badges. At 96 Overall, unlock a special Archetype, with customisable ratings caps. At 97 Overall, get some Pink Diamond packs in MyTEAM. At 98 Overall, get invited to appear on 2KTV, and at 99 Overall, get your name in the next game and a free copy. There are other rewards that could conceivably be slotted in, such as picking ratings to unlock at the next Cap Breaker, more free gear, the ability to clone your save file (which would allow you to play out some What If scenarios without messing things up), and a guaranteed head start on your MyPLAYER in the next game if you buy it and keep your save file intact. The important thing is that the Road to 99 provides worthwhile rewards throughout the journey, and incentives that make it enjoyable to keep grinding. My blueprint may still need a bit of tweaking, but repaving the Road to 99 will make for a smoother journey, with more interesting milestones along the way.